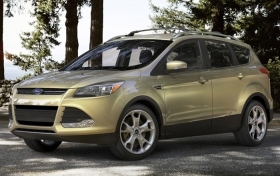 LOS ANGELES -- The 2013 Ford Escape makes a major break from its former conservative styling, with a sleeker, more aerodynamic design that takes cues from the Ford Focus. It also will be offered with loads of new technology as Ford hopes to build on its strengths in one of the industry's fastest growing segments: the entry-level crossover. -- An available hands-free power rear liftgate operated by motion-sensing technology. Customers can activate it by making a gentle kicking motion under the rear bumper. -- Curve Control, which automatically slows the vehicle when it's going too fast in a corner, and Torque Vectoring Control, which uses the brakes to balance the distribution of torque between the front wheels for greater stability during corners. Ford will offer the Escape with 1.6- and 2.0-liter four-cylinder versions of its EcoBoost engine. Ford will no longer offer a V-6 or a hybrid version. Ford will offer an updated version of the normally aspirated 2.5-liter engine, but only on the base S series. All other models will come standard with the 1.6-liter engine. Ford expects about 90 percent of volume to come from the two EcoBoost engines. The Escape's interior will feature upgraded materials, including a soft-touch instrument panel and deeper armrest cushions than on the previous-generation Escape.